Rep. Cathy McMorris Rodgers says members of Congress too often find themselves reacting to initiatives pushed by the Obama administration instead of setting policy. 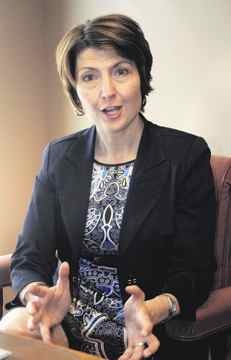 A Republican in Washington's 5th District, McMorris Rodgers spoke with the Capital Press about her first six months on the House Energy and Commerce Committee. "Unfortunately, I see an agenda being driven by the Environmental Protection Agency that too often means it's a hands-off approach," she said, citing a pending update of dust regulations. "If you're on the land, you're going to be stirring up some dust and it just seems the EPA doesn't always understand that," she said. McMorris Rodgers said the agency has been producing rules as quickly as it can, for agricultural dust, biomass, cap and trade and limiting emissions. Members of Congress are put on the defensive, having to respond to the agency's rules, she said, rather than working as elected officials deciding public policy to be implemented by agencies such as the EPA. Dust particulate and biomass rules have been delayed for three years, McMorris Rodgers said. "It still begs the question, what's going to happen in three years?" she said. "It's really adding to the uncertainty." Earlier in the year, McMorris Rodgers reintroduced legislation that would require electricity bills to include the portion the Bonneville Power Administration spends on the Endangered Species Act. She estimated about 30 percent of electric bills are dedicated to fish labeled endangered or threatened under the ESA, and said costs continue to rise as the works to stop generation of energy at times or works on studies. The legislation is in the House Resources Committee, chaired by Washington Rep. Doc Hastings, who supports it, McMorris Rodgers said. It must also pass the Senate and be approved by President Barack Obama. "It's a transparency bill," she said. "I think it's appropriate we look at the actual costs associated with some of these bills and be clear with the consumer." Though she hopes it will pass, she said there have also been discussions with the BPA about disclosing the costs without legislation. She's also been taking steps to increase interest in hydropower, noting it's played an important role in the transformation of the Pacific Northwest into one of the most productive and varied agriculture regions in the country. McMorris Rodgers said the country could double hydropower without building a new dam, by investing in new technology and turbines at existing dams. "Energy in general is one of the keys to our economic recovery," she said. "We need to start saying yes to everything." McMorris Rodgers wants to keep farmers competitive. "There are more and more demands put on us as far as water and land-use restrictions," she said. "That concerns me, as to what other restrictions may be put on water and land and what that means for our farmers."